Home > Tech > This Email Is a Trap! Would YOU Have Recognized It? In order to protect your private information and navigate the murky waters of the Internet and email safely, you need to become an expert at recognizing deceptive and potentially dangerous emails. I got a very official-looking email today, and it is a great example of how sophisticated email scammers have become. This is a warning-style phishing email. It is designed to make you think there is a problem with your account so that you will click on a link to “resolve” the problem. Now if you don’t bank with USAA Federal Savings Bank, you would dismiss this email in a second, or at least decide it was sent by mistake. But what if you DO bank at USAA? 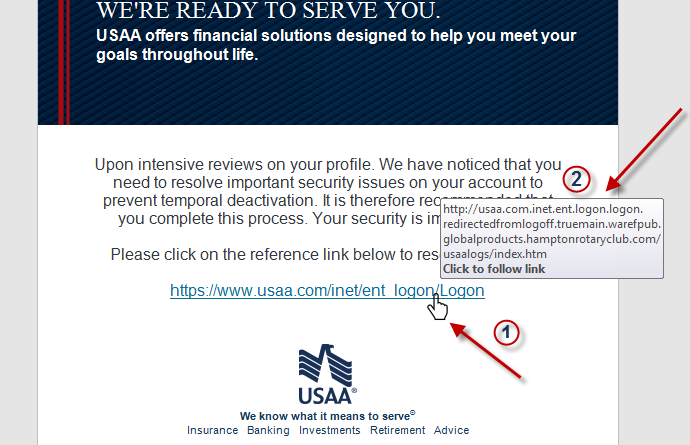 You might be tempted to follow the recommendations of the email, which could lead you to click on a link and give away personal information – information that the scammers could use to access your USAA account, or worse! Because the email looks so official, it is easy to be fooled if you’re not careful. 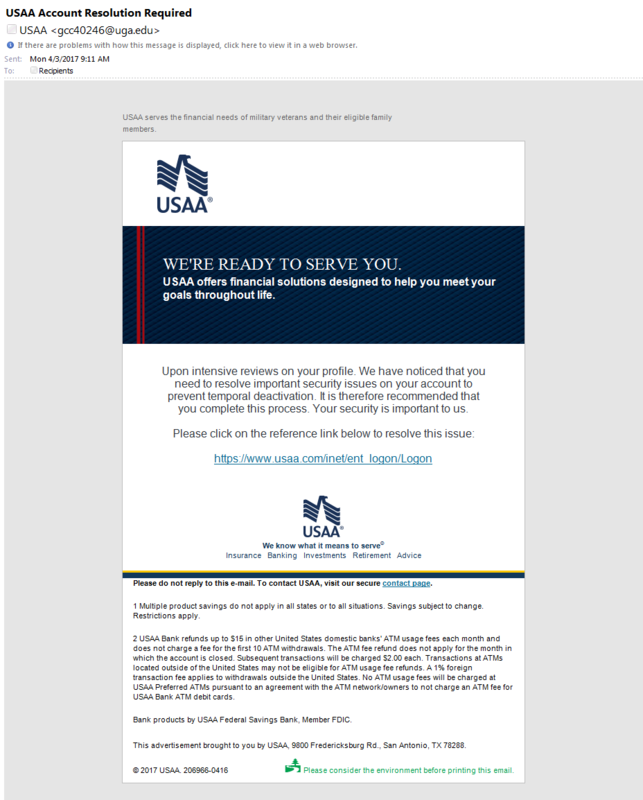 These particular scammers have taken an actual USAA email and “doctored it” to try to deceive you. But, if you examine the email closely, you’ll find a number of clues that will tip you off to the scammers’ deceitful trap. Let me say first of all that not all of these will show up in everybody’s email program. You may access your email over the Internet, perhaps going to Gmail’s website, or the website of your Internet service provider, for example. That’s called “web mail.” You may have an email program on your computer that you use to read your email (Outlook, or Windows Live Mail, for example). That’s called an email “client.” Either way, you will see at least some, if not all, of these tip-offs. Let’s look closely at each of these. 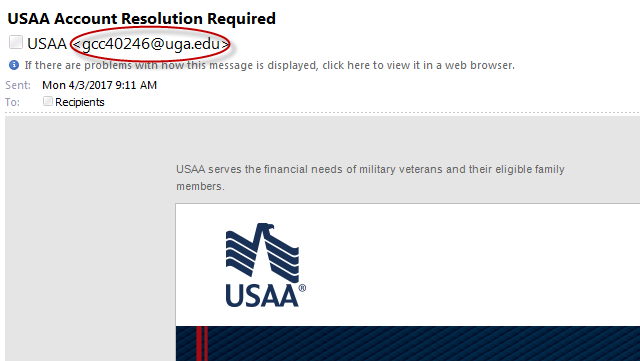 USAA’s Internet domain (the part after the @ symbol) should be USAA.com, not uga.edu, which is the University of Georgia. Sometimes a company will use a mass mailing service for general mailings, so a legitimate return address may not always be USAA’s domain, but, it will never be something that looks like someone’s personal email address or something generic. In this case, the email is not addressed to me, but rather to “Recipients.” That’s a dead giveaway! How can this email be about my personal account issues if it isn’t even addressed to me? And the fact that Recipients is plural means it is being sent to lots of other people to make them think they have a problem as well. 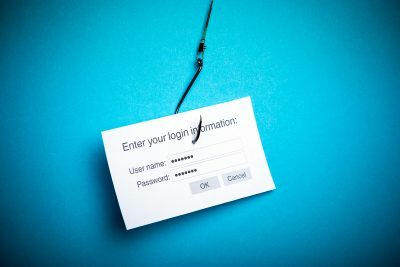 Most phishing emails are composed in other countries, by people for whom English is a third or fourth language. Real emails from companies in the US seldom have glaring errors in grammar, and tend to be worded very professionally. In spite of the fact that this particular email has a very professional look, it is obviously written by a non-native English speaker. “Upon intensive reviews on your profile” is not a sentence by itself, nor is it grammatically correct. It should be the opening clause of the sentence, and continue with “we have noticed.” It should be worded something like, “Upon close examination of your profile.” “Intensive” is a bit exaggerated for a message like this. Also, the phrase, “temporal deactivation” is suspect. “Temporal” would be an unlikely word choice. But, quite honestly, the text in this one is much better than most phishing emails. In many email programs, if you (1) hover over a hyperlink, the (2) true link will display. In a legitimate email, they would be exactly the same. But here, clearly, they want you to think you’re heading to USAA’s customer login page. But you are actually being redirected to a page they have made to resemble it. When you go to that “fake” page and log in, they will get your user name and password. This may be enough to give them access to your account. 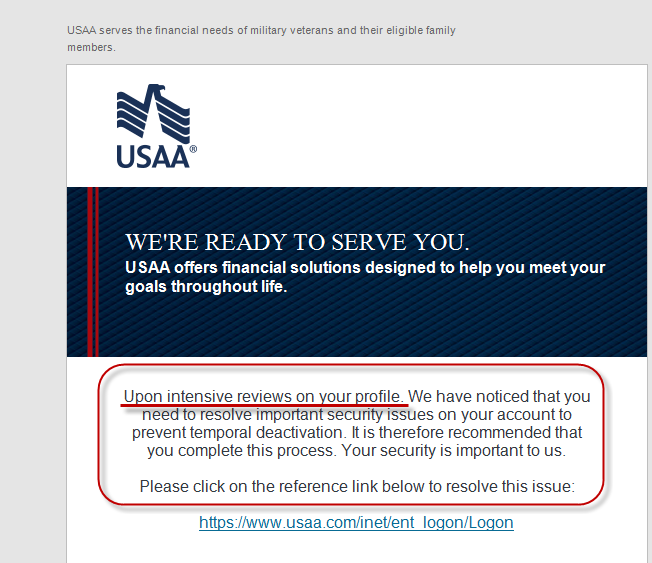 Even though you see “usaa.com” at the beginning, that doesn’t mean anything. The real domain being accessed is “hamptonrotaryclub.com.” It is likely that whoever has that domain has no idea that someone has hacked it and set up these scamming pages there. Though the scammers have gone to great pains to make the email look legitimate and official, if you take a moment to THINK BEFORE YOU CLICK, you could save yourself some serious difficulty. They are counting on your becoming alarmed by the message and quickly clicking on the link. But you don’t have to fall for it. I hope that being armed with these “red flags” will be enough to deter you from impulsively clicking on deceptive emails. Using the Internet (and email) with wisdom and discernment can go a long way toward keeping you safe from the bad guys.